Gianyar is the administrative capital of the Gianyar Regency, and the perfect destination to base your holiday in Bali. Home to one of Bali’s oldest kingdoms, it’s the best place to find traditional handicrafts and art, discover ancient temples, and enjoy the natural beauty of the island. Book your Gianyar hotel today and start planning your next holiday! Just north of town is Pura Dalem. It’s a temple with excellent stone carvings and it’s great for a walk around before visiting the small weaving industries in Gianyar. Once you’re done, drop by a local restaurant for lunch. While you’re in Gianyar, there’s no going past trying the region's most famous food, roasted babi guling (suckling pig) – it’s absolutely delicious. The souvenir market in Sukawati is another must-do, and is the premier destination for browsing through handicrafts, stone carvings and silver works. In the same area Celuk Village hosts Bali’s finest craftsmen, your best chance to find a one-of-a-kind piece of gold or silver jewellery. Bedulu-Pejeng is home to the oldest temples in Bali. Goa Gajah, also known as the Elephant Cave Temple, is carved into the rock face and dates back to the 9-12th centuries. Entering the cave through the mouth of a giant demon makes for an amazing memory and once you're inside, check out the shrines with elements of both Hindu and Buddhist beliefs. Another treat is the unique architecture and stunning views from Samuan Tiga Temple. The locals believe this is the venue for the great meetings between Gods, Deities and Saints. Flanked by two rivers, the beautiful gardens contain many sacred Banyan, Pule and Curiga trees - so take your time and enjoy the peace and serenity. When you reach Penataran Sasih you can see one of Southeast Asia’s oldest artefacts, a huge bronze kettledrum known as the Moon of Pejeng. It’s a relic from the Bronze Age and the highlight of the archaeological museum. Meanwhile, Ubud is the centre for ecotourism, so if you love nature you can get your fill of walking trails and hikes through some truly remote environments. The most spectacular leads you to Petulu. If you time your hike just right and arrive at dusk, you’ll witness thousands of herons returning to the wetlands - a must for any serious bird lover! For the adventurous, book a rafting trip on the Ayung River, where the rapids make for an exciting ride as you race down the river. Love surfing? Then get to Keremas Beach. Just outside of Blahbatuh it’s one of the best breaks in Bali and formed one leg of the ASP’s 2013 World Championship Tour. Book a flight to Bali and come enjoy this spectacular part of Indonesia on your next vacation. The history, culture and natural beauty will leave every traveller in awe, so why are you waiting? Book your Gianyar accommodation today and start planning your next trip. Treat yourself to a great holiday - you deserve it! 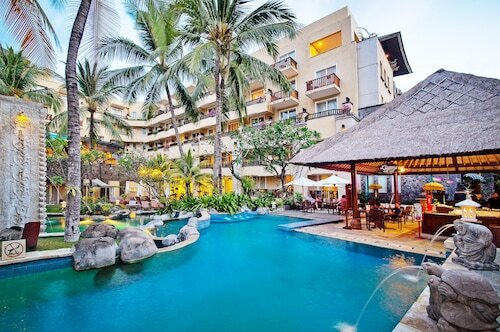 How Much is a Hotel Room in Gianyar? 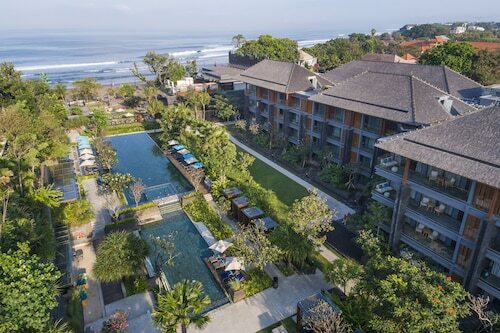 Hotels in Gianyar start at AU$19 per night. Prices and availability subject to change. Additional terms may apply. Our stay was beautiful. We loved every minute. Food and beverage is expensive but that is to be expected given location and Hyatt brand. My only negative would be that kids club should be included free for at least some hours. It is too expensive and because of that we only used it one time but our kids would have loved more.